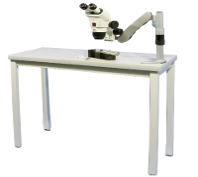 For the preparation of the sample before injecting it in the HPM-010 we offer a sturdy workstation with a fixed stereo microscope. We are happy to announce that Freezer Hats are now available from Ted Pella, Inc. at prices significantly reduced from previous commercial levels. The planchet designs are roughly shown above in cross section. They are available in brass only. Depths of cavity in the planchets are 0.1, 0.2 and 0.3mm. Using the two planchets, one on the other, in various combinations, permit the cavity thicknesses as illustrated above. With over 100 installations world-wide, and more than 400 scientific publications to its credit, the HPM-010 is not only the pioneer of HP freezing, but the instrument of choice which allows freezing of aqueous samples up to 200µm thickness without visible ice crystal damage and without the use of cryoprotectants. Highest quality freezing of tissue samples in thickness ranges of up to 6mm without requiring freeze protective additives. Array of specimen carriers available, i.e. for suspensions (capillary tubes), tissue extracted by fine needle biopsy and carriers for monolayer cell cultures. In situ real time measurement of temperature and pressure. Fast 90 second process cycle allows expeditious application. Automatic, microprocessor controlled operation for routine work. Compact, sturdy unit with soundproof and vibration-free housing. Simple and safe operation due to quick-locking action of specimen holder and clearly arranged operational controls. Processing data are recorded on digital display, such as the actual temperature, time and pressure, thus allowing the user to exactly evaluate current operational status (sample quality control). Officially approved materials and high pressure components, as well as twice controlled sample holders with quick-lock action ensure highest level of safety for user. Simple maintenance with removable cover plates and rack system for control units. Freezing of large tissue specimens without requiring structure-altering freeze protective additives. Best suited in conjunction with subsequent freeze substitution, followed by low temperature embedding and polymerization for sectioning in a conventional ultramicrotome. Suitable for samples destined for subsequent thin sectioning in their frozen state by cryo ultramicrotome for cryo TEM analyses. For samples intended for subsequent freeze drying and SEM or TEM investigations. The High Pressure Freezing Method Excellent freezing of the specimens intended for examination in the electron microscope is one of the most important prerequisites for achieving reproducible results from the various subsequent cryopreparation methods. The conventional freezing methods in use are plunge freezing, jet spray and cold block (slamming) cryo fixation. However, due to the poor heat conductance of water, these methods can only satisfactorily freeze specimens measuring up to between 10 and 20µm. Thicker specimens (such as tissue samples) could only be frozen in the past, if a cryoprotectant was added to lower the freezing point of the water in the specimen. The disadvantage of chemical cryoprotectants is that they often affect certain cell structures, causing different types of undesirable artefacts. By using the high pressure freezing method developed by Prof. Moor (ETH Zurich) these artefacts can be eliminated. The high pressure method is based on an entirely physical phenomenon that lowers the freezing point of water. 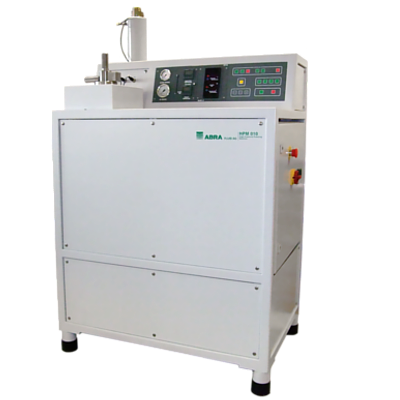 This method functions as follows: At 2,100 bar the melting point of water drops from 0C to -22C. Under normal atmospheric conditions homogeneous nucleation (supercooling) begins at -40C. Under high pressure this nucleation doesn’t begin until the water has reached -90C (see H2O Phase Diagram). At 2,100 bar water is 1,500 times more viscous than at atmospheric pressure, which drastically reduces the nucleation and thus the crystal growth rate. This means that the extremely high freezing rate (min. 10,000C/s required for satisfactory freezing by the methods previously mentioned) is not necessary with the high pressure method. The high pressure method allows specimens up to 0.2mm thickness with a total volume of approx. 1mm3 to be vitrified or up to 0.5mm thickness to be adequately frozen at a low freezing rate of 200C/s without requiring the addition of cryoprotectants. Instrument cabinet containing high & low pressure generation system. Temperature & pressure control system. Specimen holder with hinged tip recessed for 3 mm and 6mm dia. X 0.5mm deep sample carriers. Test probe Operating & display panel. Heating thermostat with stainless steel water bath and control head. Set of spares, P/N 690069, consisting of spare gaskets, o-ring seals, piston seals, slide rings and springs. Specimen unloading device with insulated chamber 50 each type A & type B aluminum specimen carriers in 6mm and 3mm sizes. 1682mm high x 1010mm wide x 700mm deep, weight 450kg Mounted on 4″ dia. caster wheels for mobility.